But you never do, of course. 2. After a full day of calculating and helping your team to close deals, you tend to get a little slaphappy. Sometimes you save it for the ride home, though. 3. You have to wear a lot of different hats. 4. You’re juggling all you can. While your team dances and pretends to shovel behind you, apparently. 5. You’re pulling out all of your moves. …while wearing all of your lucky necklaces? 6. As the days count down, you’re trying to keep your cool. Cool as a dog on a beach. 7. You’re using all of your logic. 8. And trying not to seem overbearing — i.e., creepy — when it comes to your contact with prospects. 9. This is how you react at the mere idea of not hitting your goals. Nobody put’s Baby behind on sales numbers. 10. But before April 1, you’ll see it all come together. 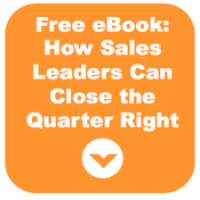 Because you are the type of sales leader who’s got what it takes to light sales up. Now get back to doing that! The end of the quarter for sales leaders can actually look like the '80s. Here are 10 reasons why.